Patrick Martinez, Angela Davis Cake, 2018. Heavy body acrylic, acrylic, airbrush, and ceramic cake roses on panel with gold mirror plex 2018. Courtesy of the artist and Fort Gansevoort, New York. The multi-faceted LA-based artist, Patrick Martinez, commands the Fort Gansevoort space with his debut New York solo show, That Which We Do Not See, in a celebratory manner. Martinez is a native Angeleno, of Filipino, Mexican, and Native American descent, and presents a visually bold, one-two punch of a show staged across three floors of the gallery. Martinez addresses the lack of diverse subjects in portrait painting, champions the under-represented heroes who paved the way, and the paramount importance of inclusion. Martinez showcases freedom fighters from our past such as Black Panther activist Angela Davis, renowned authors Rebecca Solnit and bell hooks. Martinez does so masterfully with three different styles of expression: cake painting, neon sculptures, and landscape painting. In his cake paintings, Martinez cleverly and colorfully utilizes various mediums – heavy body acrylic, airbrush and ceramic layered on gold mirror plex – to create realistic cakes fitting for a Quinceañera. But behind their sweetness, power lies beneath, social justice stalwarts like Cesar Chavez and Malcolm X are vividly remembered. On the final floor, you approach Martinez’s street memorial pieces. They are adorned with roses and window security bars on panel, and pay tribute to yet another all-too-familiar memory of the barrio, the dearly departed. Although the circumstances are dark-shadowed and melancholic, the works are garnished with roses that eulogize their lives and spirit. Martinez adds to the art conversation by thoughtfully establishing his work as a voice for those forgotten. He does so by reminding us to continue celebrating them – instead of mourning – con pasteles y biscocho. Patrick Martinez, Baby Let Me Take You Home (Night), 2018. Stucco, ceramic tile, latex house paint, neon, and window security bars on panel. Courtesy of the artist and Fort Gansevoort, New York. Patrick Martinez, Alice Walker, 2019, Neon, Edition of 3. Courtesy of the artist and Fort Gansevoort, New York. 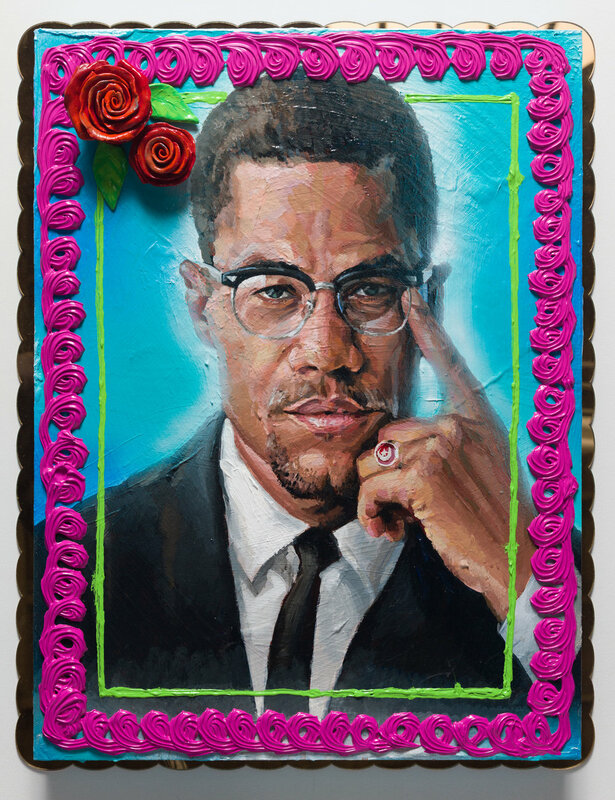 Patrick Martinez, Malcolm X Cake, 2019. Heavy body acrylic, acrylic, airbrush, and ceramic cake roses on panel with gold mirror plex. Courtesy of the artist and Fort Gansevoort, New York. Patrick Martinez: That Which We Do Not See will be on view through April 20, 2019 at Fort Gansevoort.